Wayne Kawamoto. The Spruce Crafts, 2015. Here’s another balloon that’s based on a mode of transportation, in this case, an airplane. This sculpture evokes an old-fashioned, propeller-driven “bi-plane.” Trust me, kids will love this one, and it will be a hit at any party or event. With these step-by-step instructions, we not only teach you how to make the plane, but how you can add “eyes” to give the airplane some cartoon-style character, which kids love. At parties, you can connect this airplane to another balloon so kids can make them “fly” around. This is something that you can also do with the helicopter balloons. Make these and kids can have just as much fun flying their planes and helicopters as they do fighting with balloon swords. If it helps, you can watch the process of making the airplane while following the instructions. Inflate both balloons and leave at least four-inches of uninflated tips on each. You may have to experiment with this, which will depend on how you twist the balloons. Take one balloon and make a followed by a two or three-inch basic twist. You’ve made the “propeller” and the first part of the plane’s body. Take the second balloon and make a pinch twist. This picture shows the two balloons side by side. Twist the pinch twist of the second balloon into the basic twist of the first balloon to connect the two balloons. Repeat with the second balloon on the other side to make the second wing. If you like, you can make a second pinch twist on the bottom of the plane that will make this sculpture more secure. However, if you are planning to connect another balloon as a “handle” that kids can use to “fly” the balloon, it’s probably best to not make the second pinch twist. This location is where you will attach another balloon. Cut off the remaining portion of the second balloon and tie it off. Make a basic twist of about three or four inches to finish the plane’s body, and follow this with a fold twist. You’ve started the tail. Make a second fold twist that matches the first one. Then make a basic twist for the vertical part of the tail. If you like you can finish the horizontal portion of the tail with a small pinch twist. At this point, you can cut off the remaining balloon and tie it off. 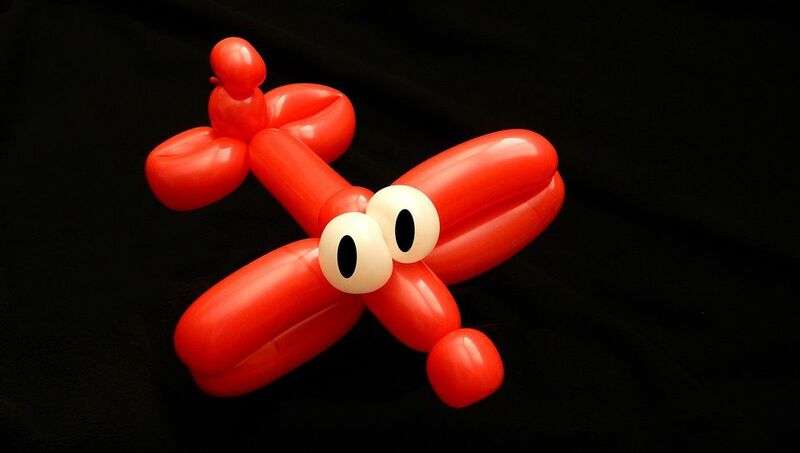 Keep in mind that you can make this plane out of a single 260 balloon. It will make a smaller airplane, and you’ll have to watch your proportions to make the balloon come out “right” with your twists. But it can be done. We prefer to work with two balloons so there’s more leeway with the proportions and we like the larger resulting plane. Inflate a white 260 balloon. Instead of leaving an uninflated tip, you’re only partially inflating the balloon, probably between two and three inches. Twist the “eyes” into the pinch twist between the top portion of the wings.